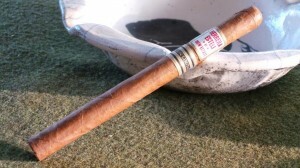 A few weeks ago on Half Ashed, we talked a bit about the latest addition to Willy Herrera’s Herrera Esteli line – a lancero. The folks at Drew Estate were kind enough to provide a couple of samples, but they have now been making their way to shelves for a week or more. The lancero, unlike the rest of the line, will be limited to 2,000 boxes of 15. They will retail for $12 per cigar ($180/box). The basic blend remains the same as the earlier vitolas, with an Ecuadoran Habano wrapper over Honduran binder and Nicaraguan filler blend – although some variation in flavor would be expected in such a narrow ring, of course. Having recently been on quite a lancero kick, I’ve been looking forward to this cigar for some time now. It should be noted that production has been marked for a 7″X38 cigar, and the samples I received were a full 1/4″ shorter. Mine were spot-on 6 3/4″, which cast some question in my mind as to whether or not they were actually from earlier work Willy had done with that size while developing this blend, rather than the batch currently making its way onto store shelves. 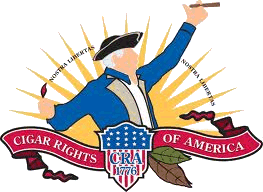 I have asked the question of Drew Estate personnel, and will update if I learn more. The samples I received bring a consistently light brown wrapper with a delicate appearance, telegraphing every bump, nook, and cranny from below. The leaf has a very silky feel to it, with only minor veining. I don’t feel any inconsistencies with the bunch, and overall it seems to be quite well made. The prelight draw provides a goldilocks resistance, and surprisingly sweet flavor. The initial puffs are bold and bright, with some of the typical spiciness found in the Herrera Esteli line. But this soon decreases significantly, settling to a more manageable level. Once fully into the cigar, I find a sweet note to the spice that is difficult to specify – although it is a bit reminiscent of cardamom-tinted Turkish coffee. In any event, I find it peculiar to this vitola and not in any of the others from the that I’ve tried to this point (short corona, robusto extra, and lonsdale). At the initial application of fire, the foot of one of my samples cracked, but the construction held true and quickly overcame the split. Since passing that, and throughout the first sample, the burn has been impeccably straight. As I get into the middle of the cigar, much of the earlier spice has dissipated and been replaced with a predominantly oaken character. Accompanying that is an incredibly long, toasty finish. The oak flavors carry strongly into the final stretch, and a pronounced sweetness presents as well. This sweetness, amplified by the ebbing of spice, really showcased the blend in my opinion. This final portion of the cigar was the most appealing to my palate. 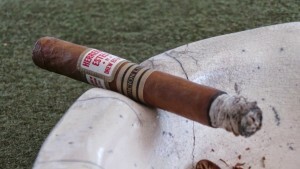 The Herrera Esteli lancero finished bold in flavor, moderate in strength, and billowing smoke like a champ. Of the sizes in this line that I have yet smoked, this is my favorite. The spice in some of the other sizes has, at times, been a bit much for my tastes. The lancero has that aspect of the blend well in check, and I found it thoroughly enjoyable. I would definitely recommend stashing some of these away while you can….